How old are you? How much do you weigh? When is your baby due? NEVER ask strangers these questions -- unless you like getting punched in the face. But if there's one prying question that's fair game in big cities, it's "How much do you pay in rent?" because everyone's on the look-out for a cheap deal. So which city keeps rent most reasonable? 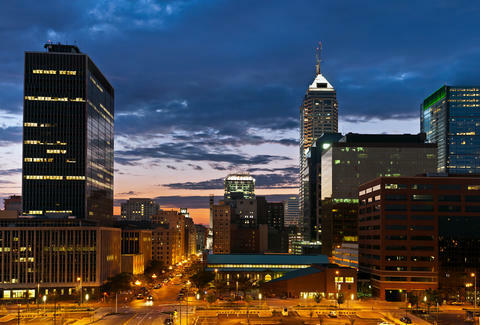 According to a recent Forbes study, it's Indianapolis, IN, where residents pay approx. $756 in rent -- the lowest in the country. And you thought a $2,000-a-month, two-bedroom railroad apartment in "Far East Williamsburg" (Queens) was a steal. To determine its rankings, Forbes calculated the average cost of monthly rent (compared to average monthly mortgage payment), percentage increase in rent per year, and median household income in the 50 largest US Metropolitan Statistical Areas. While the study found Hoosiers' (that's seriously their demonym?) rent goes up 3.3% each year, with a median household income of $55,282, they're more than prepared to handle the increase. Next up, Kansas City, MO, lands in second place with an average monthly rent at $793 that's only set to increase by a mere 2.7% increase year-on-year. And in third place, Las Vegas, NV, where you can live in sin for just $767 a month, and save the nice sum of $369 (or $4,428 for the year!) if you rent over paying off a mortgage. While another city in Missouri appears on the list, Ohio ultimately wins the list, claiming three renter-friendly cities in the top 10, including Columbus (no. 5), Cincinnati (no. 6) and Cleveland (no. 10). In terms of the worst places to rent, to no one's surprise, SIX out of the bottom 10 are in California; at no. 1, San Francisco sees renters shelling out a ridiculous $2,802 every month. Provided you're not already in a U-Haul on your way to Indy, check out the best and worst places to rent below. And consult the full rankings for each city's average rent and more.